Well, I intended to get something up this week covering the WWPD4Vets event last weekend, but as I keep forgetting my all important camera cable at work, getting the photos home is proving to be a bit of a challenge. So I'll have to settle for a list-building article instead. I'll get the WWPD article up as soon as I can get my memory to work with me as opposed to against me. Unfortunately, this article begins on a frustrating note: I can't get my Fusilerkompanie done for Snapshot! Dammit. So, its time to pull out the backups. General qualification comes down to stuff I've got painted. 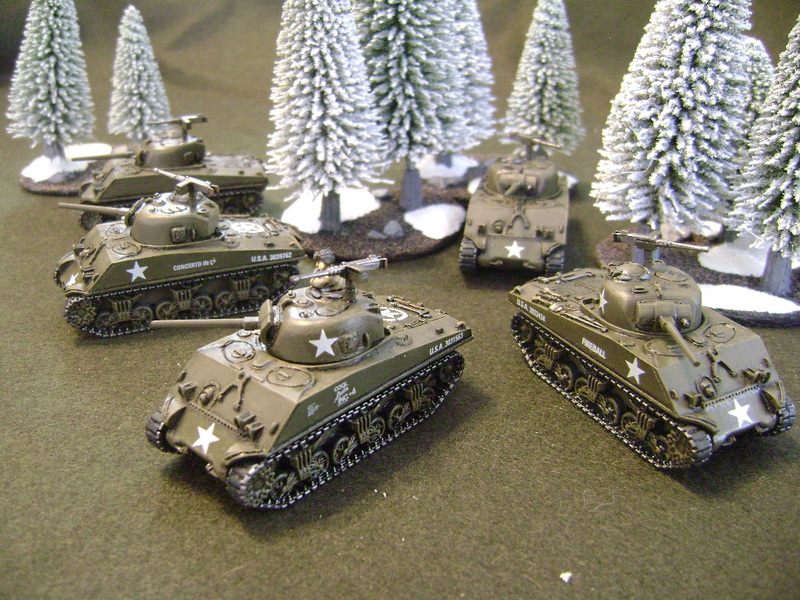 1850 points are a lot to play around with and I can't resist the temptation to run with Veteran US tanks. Time to roll out the 4th Armored Division! M4A3 (late) - I decided to load up on these tanks. I'm going to leave the 76s home and rely on smoke, stabilizers, and veteran-ness to get the job done. M4A3 (105) - One of my favorite vehicles and highly under-utilized. I'm gonna take six of the bastards. Breakthrough Guns, turreted 105mm 6-gun artillery (using Under Command), and six bloody teams for assaults... recognize! Cavalry - Obvious include for attacking. Armored Rifles - Needs no introduction or explanation really. This platoon is and has been the bee's knees. Not much to say really. 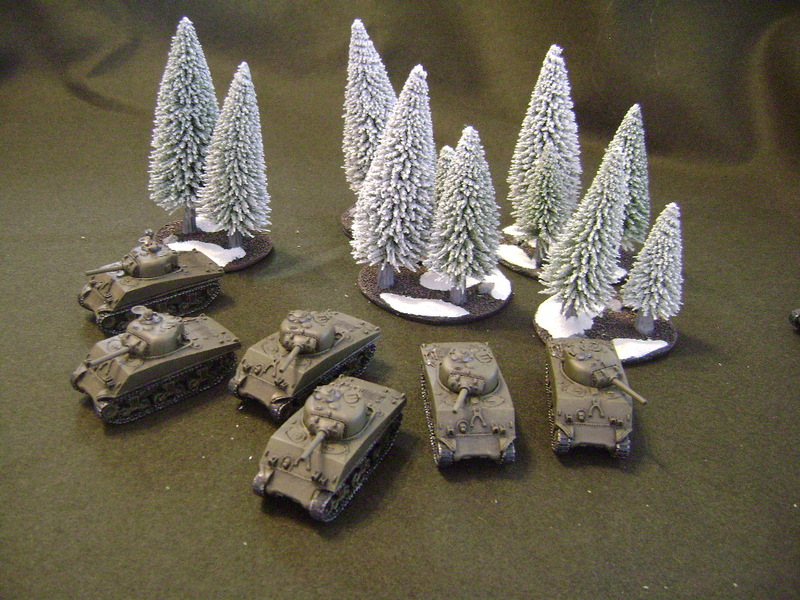 Lots of cheap Panthers and armored infantry. The trick here is to treat the armored infantry as light tanks, keeping them in their half-tracks at all times, while the tanks take the heat. The disadvantage of being reluctant is somewhat reduced by using Mounted Assault to its fullest potential. Trouble will be in prepping the target with no smoke, artillery, or reconnaissance. It can be done. Besides, 8 Panthers and 3 Pz IV/70s will tear a hole in a Soviet tank force of any make or model. Been playing a lot of these guys lately, which honestly would be the prime reason for not taking them. Still, they are an option. This will be 2nd Infantry Division or perhaps 99th Infantry Battalion with some tweaks to the list. Again, not much to say really. Pretty standard rifle company build. I kinda like it actually. 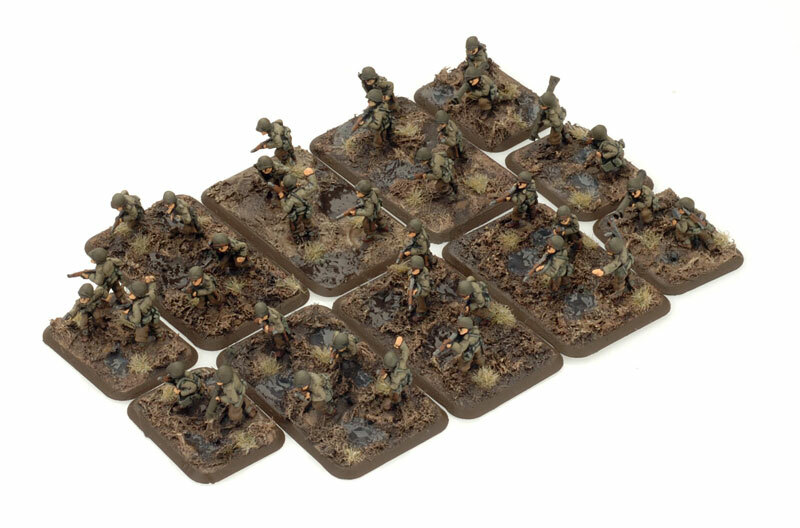 Would like to squeeze in one more platoon, but it'll do. My favorite unit, perhaps of the entire war, is the 504th Parachute Infantry Regiment. Their most impressive attack has got to be the Waal River amphibious assault. The troopers braved impossible odds, launching what many of them called a 'little D-Day'. Teamed up with the Irish Guards at the beginning and linking up with the Grenadier Guards at the end of the attack, the 504th impressed them all. Loosely based on the Waal River assault, all of the pieces are there: paras, fire support, and British tanks. Only the armored cars are a bit artificial. I think this list has a fair amount of potential in a mixed environment. Ok, so those are my back up lists. I'm leaning heavily toward the paras, but I'd love to get your thoughts on the matter. The tournament is this weekend and I need to get my list in ASAP, so whuddya think? 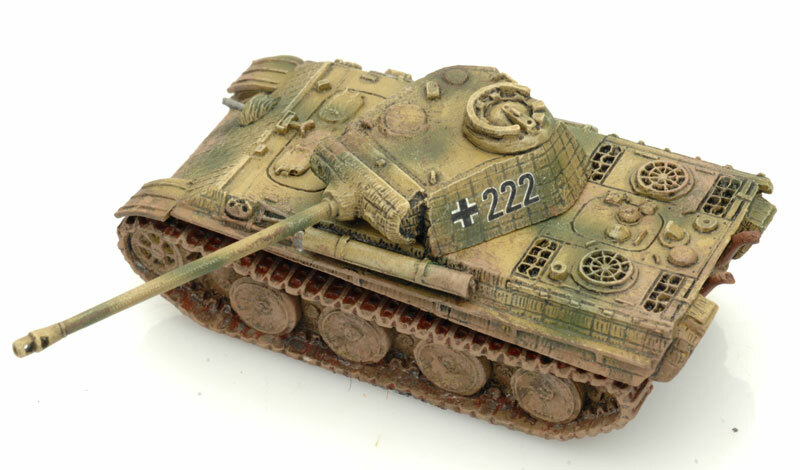 Go with the RT Panthers, always a fun list and the list has Panzer IV/70's the coolest tank in the game! 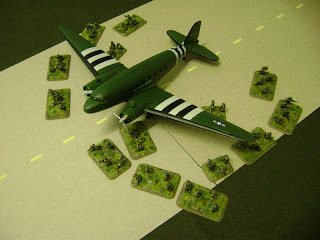 I would go for the US Paras (Market Garden). Looks like a fun and great list. I like 'em too. I still want to give them some table time this year for sure! Yeh, the US Paras are pretty cool. Great lists. I like them all. My preference is the US tank list and the Paras but hard to choose. Great post, very interesting. I'm surprised that you don't take TDs in your tank list. Thought about it, but in the end the points aren't there. The 105s take up a lot of space, points-wise and that was the reason for the list. A more competitive one might have TDs for the sole purpose of having at least something with AT 13 in the list. Ah well!